From Anonymous of Dallas, Texas on 1/24/2017 . Cards are always something nice have to ward of boredom. I was super happy to find out that these cards do in fact have their beer characters on them, making them unique and huge hit with my beer friends. 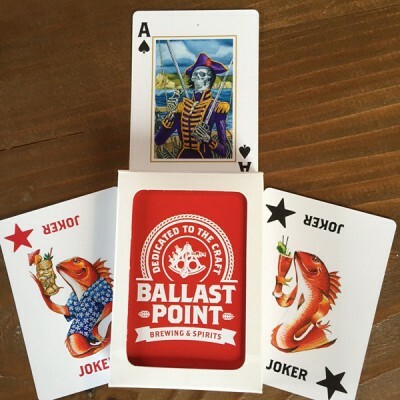 I love the art from Ballast Point and so it's awesome having them displayed, instead of just having the generic aces, hearts, etc. But I bought this among a couple other things and when you order you can request something at the end of your purchase. Thinking to myself pirate jokes would just make the whole package just a bit more awesome (It still would have be awesome regardless.) But Lord and behold! When my package finally arrived I received all my items and a hand written piece of paper with plenty of Pirate Jokes! Most cheesy dad styled jokes, but Pirate jokes nonetheless! I love this company but there was the cherry to my already handmade pie with loads of love! I recommend this company to everyone I know. Thank you Ballast Point for being a stellar company. You never disappoint!